Draft: 2013, Detroit Tigers, CBAth rd. Last name is pronounced "kuh-NAY-bull" ... Is married.....wife's name is Danielle.....the couple has a daughter named Ledger ... Attended Bastrop (TX) High School for three years before graduating from Georgetown (TX) High School.....also played basketball in high school ... Attended the University of Texas, where he was the closer for three seasons.....collected 37 saves with the Longhorns, second-most in school history (Huston Street - 41) ... Was a First Team All-Big 12 Conference selection in 2011 and 2012 ... Hobbies include fishing, golfing, hunting, cooking and brewing beer.....refers to his beer as "Bird Brew," which is a reference to his college nickname, "Bird Dog"
Went 4-3 with a 3.58 ERA and 16 saves in 57 relief appearances with Milwaukee ... Held opponents to a .194 batting average with 88 strikeouts in 55.1 innings ... His 88 strikeouts tied for sixth among National League relievers ... His 14.31 K/9IP ranked third among National League relievers ... Was 16-for-19 in save opportunities (84.2%) ... 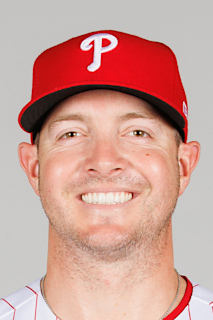 Retired 41 of 57 first batters faced (71.9%) ... Stranded 10 of 11 inherited runners (90.9%) ... Was on the 10-day disabled list from 4/6-5/8 with a strained left hamstring (missed 29 games) ... Posted a 5.08 ERA over his first 41 appearances (39ip, 22er) and was optioned on 8/24 to Triple-A Colorado Springs, where he appeared in 1 game ... Made 16 consecutive scoreless appearances to finish the season after returning to the team on 9/2, covering 16.1 innings.....held opponents to a .096 batting average during this stretch ... Was named National League Reliever of the Month and Brewers Pitcher of the Month for September/October (16g, 2-0, 0.00era, 2sv) ... Was the winning pitcher in the NL Central tie-breaker game on 10/1 at Chicago ... Appeared in 9 postseason games, going 1-0 a 0.90 ERA and 1 save ... Notched the save in Game 1 of the NLCS vs. Los Angeles ... Earned the win in Game 6 of the NLCS vs. Los Angeles ... Was nominated for the Roberto Clemente Award ... Signed a 1-year contract on 1/11/19, avoiding arbitration. Began the season on the 15-day disabled list with a left oblique strain...Was reinstated on 6/9 after rehab at Class-A Brevard County and Triple-A Colorado Springs...Had two stints with the Brewers (6/9-6/18 and 7/15-end)...Went 1-4 with a 4.68 ERA and 2 saves in 35 relief appearances...Struck out 38 batters in just 32.2 innings.....opponents batted .252 ...Retired 23 of 35 first batters faced (65.7%).....did not inherit any runners ...Notched his first Major League save on 8/23 vs. Colorado.....earned his second save on 10/2 at Colorado. Was traded from Texas to Milwaukee, along with INF Luis Sardiñas and RHP Marcos Diplan, in exchange for RHP Yovani Gallardo and cash considerations on 1/19…Went 0-0 with a 3.22 ERA in 48 relief appearances during his first season with the Brewers…Had two stints with the team (5/18-7/2 and 7/6-end)…Produced 58 strikeouts in just 50.1 innings as opponents batted just .232…Retired 35 of 48 first batters faced (72.9%)…Stranded 9 of 12 inherited runners (75%)…Went 1-2 with a 4.70 ERA and 6 saves in 16 games at Triple-A Colorado Springs. April 16, 2019 Milwaukee Brewers transferred RHP Corey Knebel from the 10-day injured list to the 60-day injured list retroactive to April 14, 2019. Right elbow injury. March 27, 2019 Milwaukee Brewers placed RHP Corey Knebel on the 10-day injured list retroactive to March 25, 2019. Right elbow injury. September 2, 2018 Milwaukee Brewers recalled RHP Corey Knebel from Colorado Springs Sky Sox. August 23, 2018 Milwaukee Brewers optioned RHP Corey Knebel to Colorado Springs Sky Sox. May 9, 2018 Corey Knebel roster status changed by Milwaukee Brewers. May 3, 2018 Milwaukee Brewers sent RHP Corey Knebel on a rehab assignment to Biloxi Shuckers. July 15, 2016 Milwaukee Brewers recalled RHP Corey Knebel from Colorado Springs Sky Sox. June 19, 2016 Milwaukee Brewers optioned RHP Corey Knebel to Colorado Springs Sky Sox. June 9, 2016 Corey Knebel roster status changed by Milwaukee Brewers. June 4, 2016 RHP Corey Knebel assigned to Colorado Springs Sky Sox from Brevard County Manatees. May 31, 2016 Milwaukee Brewers sent RHP Corey Knebel on a rehab assignment to Brevard County Manatees. July 6, 2015 Milwaukee Brewers recalled RHP Corey Knebel from Colorado Springs Sky Sox. July 3, 2015 Milwaukee Brewers optioned RHP Corey Knebel to Colorado Springs Sky Sox. May 18, 2015 Milwaukee Brewers recalled Corey Knebel from Colorado Springs Sky Sox. March 19, 2015 Milwaukee Brewers optioned RHP Corey Knebel to Colorado Springs Sky Sox. January 19, 2015 Milwaukee Brewers traded cash and RHP Yovani Gallardo to Texas Rangers for RHP Corey Knebel, SS Luis Sardinas and RHP Marcos Diplan. September 29, 2014 Texas Rangers recalled RHP Corey Knebel from Round Rock Express. September 23, 2014 Round Rock Express activated RHP Corey Knebel from the 7-day disabled list. August 21, 2014 Round Rock Express placed RHP Corey Knebel on the 7-day disabled list. July 23, 2014 Texas Rangers traded RHP Joakim Soria to Detroit Tigers for RHP Corey Knebel and RHP Jake Thompson. July 23, 2014 Texas Rangers optioned RHP Corey Knebel to Round Rock Express. July 19, 2014 Detroit Tigers recalled RHP Corey Knebel from Toledo Mud Hens. June 15, 2014 Detroit Tigers optioned RHP Corey Knebel to Toledo Mud Hens. May 23, 2014 Detroit Tigers selected the contract of Corey Knebel from Toledo Mud Hens. May 10, 2014 RHP Corey Knebel assigned to Toledo Mud Hens from Erie SeaWolves. March 29, 2014 RHP Corey Knebel assigned to Erie SeaWolves from West Michigan Whitecaps. February 28, 2014 RHP Corey Knebel assigned to Detroit Tigers. June 22, 2013 RHP Corey Knebel assigned to West Michigan Whitecaps from GCL Tigers. June 21, 2013 Corey Knebel assigned to GCL Tigers. June 17, 2013 Detroit Tigers signed RHP Corey Knebel.